0.0.0.0.1 Compared to the S8+ (right), the Note 8 is hardly bigger but distinctively edgier. 0.0.0.0.2 The button arrangement is identical. 0.0.0.0.3 Only the Note 8 (bottom) sports the S-Pen. 2.0.0.0.1 The Note 8 is the first Samsung with a dual camera. 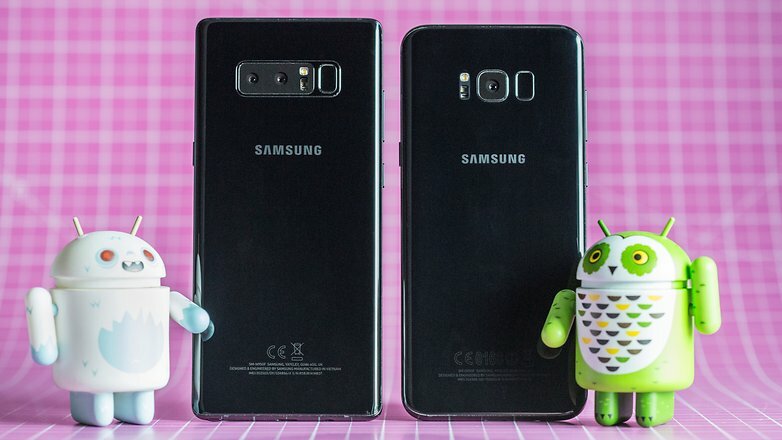 At first glance, the Samsung Galaxy Note 8 and Galaxy S8+ look like twins. But there are many differences between the smartphones which aren’t just limited to looks. The differences are also under the hood, which is where both the Note 8 and the S8+ are ahead of the pack. 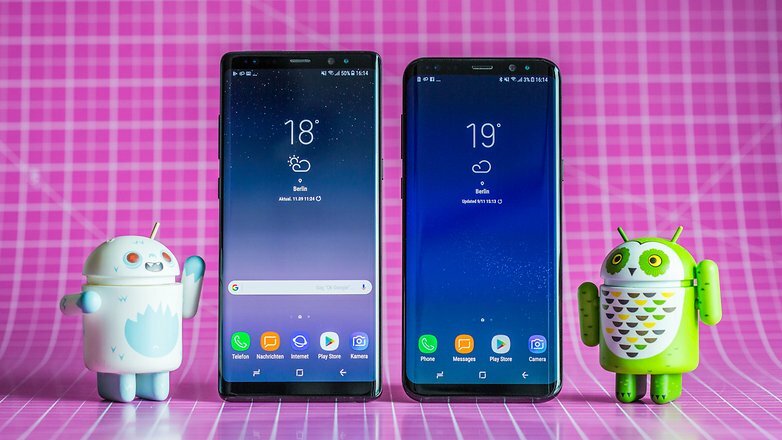 Anyone who does a side-by-side comparison of Samsung’s largest smartphones of the moment doesn’t need a magnifying glass to find the design differences; just having a second glance is enough. The Galaxy Note 8 is a little bit thicker than the Galaxy S8+. It’s also a bit more angular at the corners, but the build quality of both devices is flawless. Compared to the S8+ (right), the Note 8 is hardly bigger but distinctively edgier. The Note 8’s display is merely 0.1 inches bigger, and we estimate that the bezels are just as slim. Despite the curved glass surfaces, the Galaxy Note 8 is more massive and also heavier than the S8+. The controls, including the standalone Bixby button, are located in the same places. The button arrangement is identical. The Galaxy Note 8’s most important differentiating factor is the S-Pen. This digital input stylus, which can be pulled from below the housing as usual, divides Samsung fans. For Note aficionados, the S-Pen is what makes this device truly interesting and thus, without equal. 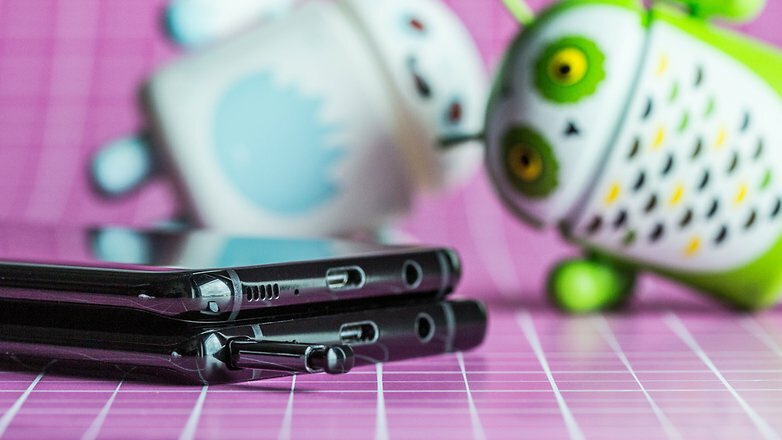 But, the pen critics do not see the need for the S-Pen and emphasize other things instead. Only the Note 8 (bottom) sports the S-Pen. There are large differences between the cameras. 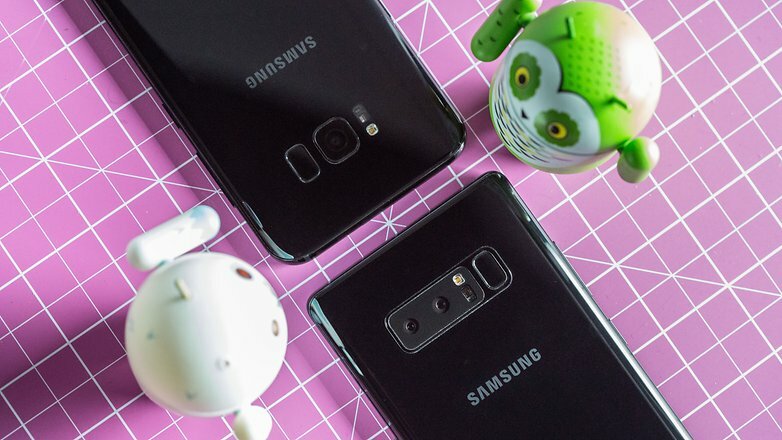 The Galaxy Note 8 is the Korean manufacturer’s first smartphone that is equipped with a dual camera, while the Galaxy S8+ takes the conservative route and has a single 12 MP lens on the back. Although the camera still has to prove its worth in our review, it already offers more opportunities for creativity. Both are evenly matched when it comes to the front camera. 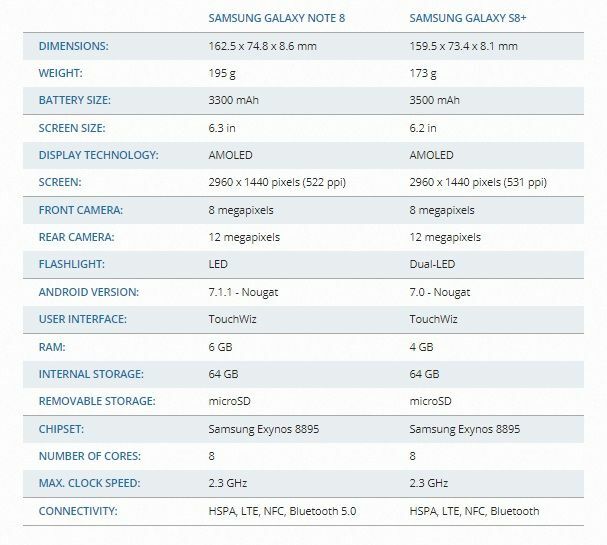 A look at the technical specs sheet reveals the following: The Galaxy S8+ has the larger battery of the two Samsung smartphones, and that’s in spite of the smaller size and thinner body. To make up for it, the Note 8 offers the S-Pen, which takes up space inside the body as well. Furthermore, the Galaxy Note 7 battery incidents caused Samsung to stay on the safe side and, for better or worse, not go for maximum capacity. As a result, the Galaxy S8+ lasts a bit longer on one charge, even if the differences are minor in practice. Both Galaxy smartphones support quick charging and wireless charging. Performance wise, both smartphones are very close, which is no wonder since they are equipped with the same processor. RAM is the only thing where the Note 8 has a bit more to offer, which is hardly noticeable in practice. The Snapdragon 835 (or the Samsung Exynos 8895 outside of the US), powers both XXL smartphones and you won’t have to wait long for apps to load or deal with a laggy browser with either phone. The Note 8 is the first Samsung with a dual camera. 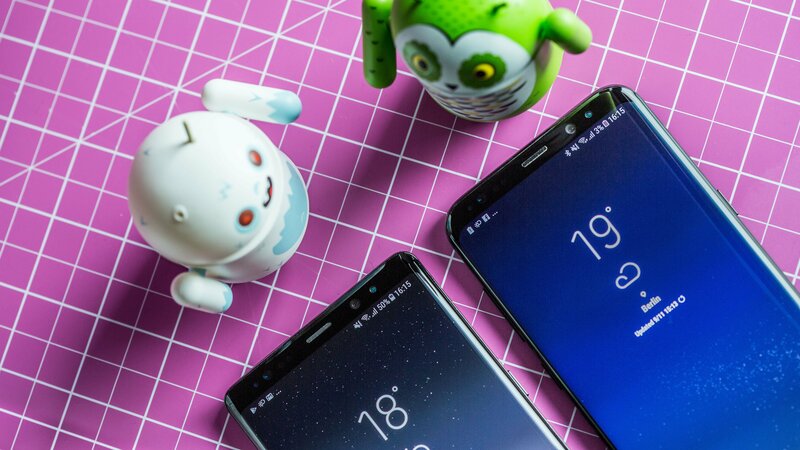 There is quite a price difference between both smartphones, with the Galaxy Note 8 starting at a full $929, which is $80 more than what the Galaxy S8+ cost when it was released on the market ($850). Now the price for the latter has dropped further, and you can currently get it for as little as $659, which is an enormous $270 difference that will make some Note fans think twice.